In 1908, the Grocery Manufacturers of America was founded and was headquartered in Washington DC. One hundred years later, in 2008, the name changed to Grocery Manufacturers Association when GMA merged with the Food Products Association, making GMA the world’s largest junk food and toxic beverage trade association on planet earth. They also represent many toxic consumer products. In 2010, GMA played a role in the fake “Let’s Move” campaign Michelle Obama ran to reduce childhood obesity–by taking advice from the junk science manufacturing and propaganda industry and failing to mention anything to the “shoppers” and children in the “shopping guide” about GMO ingredients, artificial sweeteners or toxic nitrates in anything she pushed. GMA recently proposed to label all GMO (genetically modified organisms) as “natural” even though GMO means the insertion of toxic pesticide genes and synthetic chemical herbicide applications inside and sprayed onto US crops, which is nothing even close to natural. On the board of directors for GMA you’ll find the Chair–Mr. Gary Rodkin, also CEO of ConAgra Foods. ConAgra is not selling anything “sustainable.” At Vice-Chair of GMA you will find Mr. Ken Powell, CEO of General Mills. General Mills is not selling anything “sustainable.” At Treasurer and Secretary position GMA presents Mr. William B. Cyr, also the President and CEO of “Sunny Delight Beverages” – that fake orange juice drink full of toxic corn sugar, modified corn starch, canola oil, toxic artificial sweeteners and other artificial ingredients. “Sunny-D” is NOT filled with ingredients that are “sustainable.” Sunny Delight Beverages is not selling anything “sustainable.” And what is the profile of the memberships in GMA? The federal government in the US, which is mainly run by bureaucrats partnering with corporate lobbyists, wants to keep all genetically modified foods (pesticides, including herbicides and insecticides) unlabeled to protect the interests of the pharma, Big Food, and biotech industry partners-in-crime, so to speak. The feds do not want individual US states to write and enact their own laws that make products bare the label of GMO–the same label that 90% of Americans already want on their food choices. Big government wants control over hiding ingredients that generate huge profits but are controversial in conversations about health, preventable disease, autism, Alzheimer’s disease and of course cancer. Grocery Manufacturers Association goes WAY out of their way to keep consumers in the dark about ingredients in food, and GMA tries their best to snuff State legislation for GMO labels and confuse likely voters by using false advertising, jargon written by industry hacks, and spreading propaganda for Monsanto. The Urban Dictionary defines money laundering as, “The process of hiding the source of illegal income by processing it through a large-turnover entity…” This reflects accurately what is happening with GMA’s opposition to I-522. This type of “gathering and use” of the money violates Washington State law, by hiding the source (like the mafia do). If the public knew, they would boycott the products of these contributors. Alternative media provides not only the list and the sources, but the words from the mouths and emails of industry insiders and whistleblowers. This is part of the truth media explosion of information, knowledge, and the online sharing of records revealing the hidden agendas of entities like the GMA. On the other end of the spectrum, Natural News contributed $12,000 to the YES on 522-campaign–to label all GMO and GMO-containing products in their fight for human rights and the right to know what’s in our food. Natural News has a good track record for reporting factual health news and factual statistics in the war for clean food. The Governor of Vermont, Peter Shumlin, signed the historic bill REQUIRING food manufacturers to label GE foods and drop their shady practice of calling them natural or all natural. This defied Monsanto’s lawsuit threats, by the way. GMA filed lawsuit to sue Vermont in federal court to overturn the legislation. 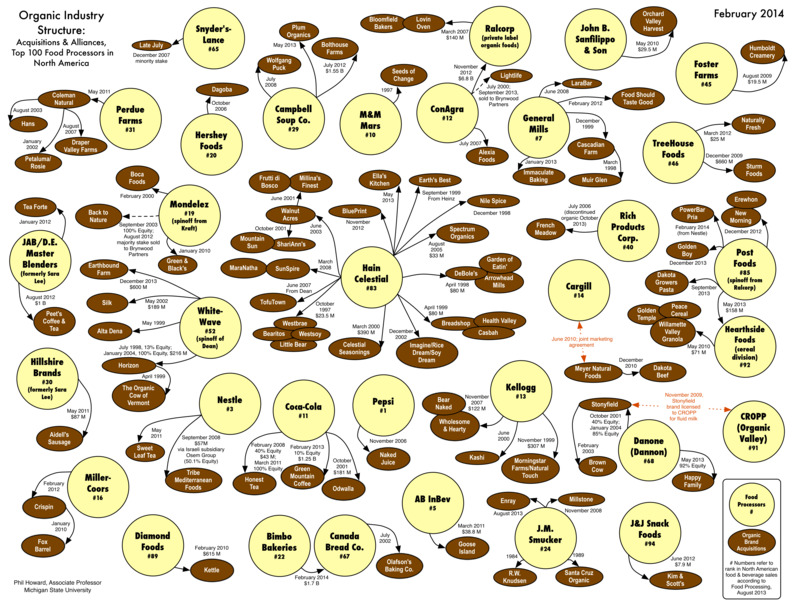 This is how deep the criminal corporations alliance digs to ruin people’s right to know what’s in their food. This is the epitome, the ultimate FAIL story, that people should remember when shopping for food and seeing the corporate names on the product box, bag, can or package. Coca-Cola, Dow, General Mills, Kellogg and Sunny Delight, where are you hiding today? Did you buy out an organic firm and turn their products into GMO hybrids? Let’s check in with Cornicopia’s Map of Sellouts. (11) Vermont is poised to defend itself and has established a “food fight” LEGAL defense fund. The “heartbeat of America” isn’t reliant on monopolistic corporations, that’s for sure. Producing the most non-sustainable, toxic products for consumption, these industry heads are the heads of snakes that infect the food supply with poisonous venom (known carcinogens, heavy metal toxins and synthetic pesticides). States need to ban together to defend against this full on toxic food assault. If consumers share this information and stop buying and growing GMA-corporate-related products, those companies will go bankrupt. As an informed consumer, you would not want to support non-sustainable, chemical-laced seeds, crop, food, pet food, or chemically-based medicine for that matter. If you have a “green” mind and want to avoid corporations that have no ethics and are not running safety tests on their products, here’s where you start. Grocery Manufacturers Association can keep on promoting genetically modified food and processed carcinogens as natural and “all natural,” and they will. In the meantime, the consumers can take all the “power back” by learning who’s selling what and boycotting the known “chemical criminals” that infiltrate our common foods, drinks, personal care products and medicines. Pay close attention to the U.S. Right to Know group and their valient efforts that are exposing the biotech industry for collaborating with shills posing as public scientists and journalists–in order to pull the wool over the public’s eyes. Keep up with Cornicopia Institute for updates on sellout brands and companies, and follow the Instititue for Responsible Technology for updates on the dangers of consuming anything GMO. Lastly, don’t believe the propaganda purported by biotech front groups like GMA, Genetic Literacy Project or GMOAnswers.com. These are the epitome of a bad education.